We are pleased to announce that Lucidchart now integrates with HipChat, a free chat service for your team. HipChat keeps you connected through group chat rooms, video chats and more. Lucidchart already provides free integration with two other Atlassian products, JIRA and Confluence, making it the first and only third-party app to integrate seamlessly with all three of these Atlassian products. Integrating Lucidchart and HipChat allows your team to have ad hoc brainstorming sessions in real time, anywhere in the world. All you need to do is type the /lucidchart command in any HipChat room, and it will create a Lucidchart diagram that everyone on your team can collaborate on. Ideas produced in a brainstorming session will be visible and accessible long after the meeting is over. Instead of hashing out ideas on a whiteboard, simply type /lucidchart in the message bar of any HipChat group room and join a working session with your team to start collaborating visually. Now your entire team -- even those working remotely -- can add ideas to the diagram in real time. No more taking pictures of the whiteboard when you’re done -- your brainstorming is already documented in an editable, readable and searchable format. Need to start a conversation around an idea, process or problem? 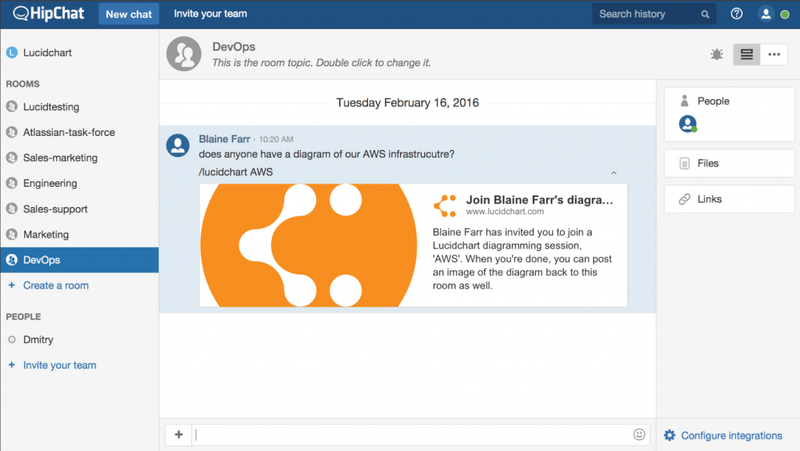 Use the Lucidchart share button to post a diagram to a HipChat room for further group discussion. In Confluence, the results of your brainstorming session are shared safely on a centralized platform. Organize your work, create documents and discuss everything in one place. Creating flowcharts, wireframes and other diagrams adds a visual component to complicated ideas. JIRA allows you to take action on these ideas by planning, tracking and reporting on your projects. Product - create a document in HipChat to collaborate on product design and brainstorm ideas. Embed these ideas into Confluence and add notes, research and data to support the ideas. As your plans turn to action, simply attach the diagrams to JIRA tasks to ensure seamless communication of any work that needs to be done. Engineering - post an existing Lucidchart UML or network diagram back to HipChat for team discussion. Make edits to the document as needed, then embed it in a Confluence page for future reference, or attach it to a JIRA issue to clearly communicate the underlying architecture. Marketing - create a flowchart in your marketing HipChat room for everyone to map out their email campaigns. Identify gaps or excessive emails and embed the flowchart into Confluence for future reference. Bring everything together in JIRA and track the emails that need to be adjusted, who's responsible and when assignments are due. They say good things come in three, and the seamless Lucidchart integration with HipChat, Confluence and JIRA is evidence of this. Using Lucidchart with this power trio increases the effectiveness of your team’s collaboration from ideation to action -- saving you time and money. It’s all part of our mission to ensure Lucidchart works wherever you do!